After the Ordination, we headed to the basement of the Cathedral for the reception, to receive First Blessings, and with the right disposition, plenary indulgences, from the newly ordained priests. Following the Bishop, or Cardinal in this case, that presided over the Ordination, the Priest's parents are usually the first to receive blessings. 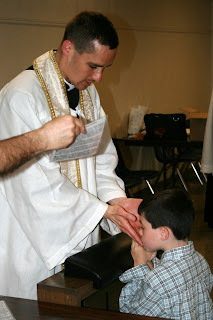 After the blessing, it is a custom to kiss the hands of the priest since, "during ordination a new priest’s hands are anointed with chrism as a sign of consecration and of the change that has been effected in his soul. The custom of kissing his hands stems from a recognition of the fundamental change that has occurred and of the particular importance of the sign of the hands in priestly ministry. After ordination the priest uses his hands to hold the Eucharistic species during the consecration, to make the sign of the cross while absolving sins, to anoint the sick and dying, and on occasion to impart the sacrament of confirmation." Following my hubby's parents, it was Captain's turn, along with the rest of the family. Twinkle Toes also had such a great time getting to know her cousins... It is too bad we all live so far away from each other! Nevertheless, we were able to get a quick photo before everyone changed to go over to the next reception at the McNeely home. Look, I was still smiling, even though I smelled like puke! :) Nothing could put a damper on this most special day. Unfortunately, I was thrown up on yet again at dinner -- though this time I was prepared with an extra shirt in the car! After dinner (and a couple calls to my children's doctors office) we headed back to the hotel to get some rest and prepare for Father's First Mass, and Captain's First Confession and Communion the following morning. Oh Jessica! How horrible! I mean the throwing up part and on such an important day... well, at least you never forget it! Jessica, may God bless you for your joy despite the "cross". Thank you once again for sharing all of the photos. You have such a gorgeous family! I love the pictures of the kissing hands. It must have been such a beautiful moment for him (priest). I like the "harumph" pose of your second daughter! Guess she didn't want her pic taken at that moment? Classic! And that is SO her! :) She can be cute, and she can also be a real stinker!! !